The right art can truly make a space sing, but buying a print online can be intimidating. Here’s how to be sure you’re getting exactly what you want. Every home deserves to be decorated well. And while the right furniture, fixtures and fittings all make a difference, the right art can truly make a space sing. Since we can’t all make it to Art Basel each year, online shopping has become more and more the way to bring art into our homes. Selecting the finishing pieces for your space through a computer screen can be intimidating, but with a little research you can be sure you are getting exactly the thing to set off your space. Some people will design an entire room around a specific painting or piece of sculpture. But if you don’t have your heart set on this as a focal point, you’ll want to select something that appeals to you, but also works with the rest of your space. First, consider your interests. Do you spend each weekend hiking in the woods? Swoon at the sight of a beautiful building? Spend more time behind a camera than in front of it? Art is an expression of human passion, and this is a great way to showcase what’s meaningful to you. Think about what piques interest in your heart, and start searching for something that does the same for you visually. Next, think about scale. You don’t want an art print that is so small it gets devoured by the blank space around it; nor do you want the art itself to loom over the space like an imposing boulder. Think about any other art you might have hanging, as well—more is not always more. A hanging piece of art should have some breathing room, so you can focus on the piece and it can play a role in your room design. And for especially large pieces, you might need to consider your furniture and room layout and plan accordingly. And finally, consider color. Color is a huge part of any art piece and will influence the overall feel of a room. Monochromatic pieces with many shades of the same color are generally more calming to the eye. Bright colors are going to draw attention and might be the visual “pop” in a room. So, while you might love a particular piece, think about its role in a room to ensure harmony throughout the space. Once you find the art you want, you need to select a way of displaying it. From raw canvases to multiple mats to the finishes of the frame, there are lots of options for presenting your art. Framing art is a way of drawing attention to it and signifying importance. Frames can range from classic carved wood to simple clean lines of molded aluminum. Walls painted a color? A deep white mat can be a great way to “pop” the work and keep it from blending into the wall color. A popular modern style is a “floating” frame, which leaves a gap between the edge of a canvas and the frame, leaving the blank space to act as a mat. While canvases will have a frame applied directly around it, most prints require some kind of mat, especially if it is not a standard size. Mats are a great way to further highlight the content of the piece and can even be stacked together to draw out specific colors and texture. They will generally make a piece feel more formal. Of course, you can opt to leave a piece unframed, as well. This can have a more raw or intimate feel to the work, like it came straight from the artist’s studio. 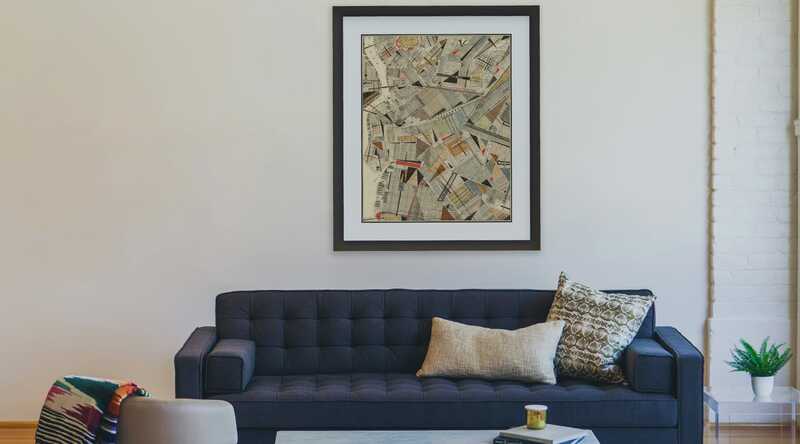 While you might have a swath of white wall just begging to be filled with something, where your art is hung should contribute to the overall balance of the space. You don’t want to just plonk a piece right in the middle of a wall. Instead, think about how the art will be viewed. The center of the piece should be at eye level, and you’ll want to make sure it has enough space around it to be viewed—so not terribly crowded by other things on the wall, behind a lampshade, etc. The best tool for planning scale and placement of art in a room is basic painters tape. The low tackiness makes it perfect for blocking out space on a wall without damaging most paint surfaces. This lets you play with placement before committing to a hole in the wall. Like anything worth doing, collecting art can be a challenge. But with patience and a little work you can also fill your home with amazing pieces that bring you pleasure. Just think about your space, scale and colors, and you will be able to find something to fit your home.